“YOU HAVE TO STAY HERE! Reef Break Resort is only just over an hour out of Tokyo. If you want to get out of the hustle and bustle, this is where you need to go! Markus was a great host - picked us up from the train station, took us grocery shopping and gave us a full tour of Reef Break Resort when we got there. He was a very down to earth, nice and friendly guy. His daughter and wife were also two of the nicest women we had the pleasure of meeting while visiting Japan. The accomodation - to say we loved it would be an understatement! It was amazing! The yurt was so cool - every corner had something interesting or a humorous bar sign. There were board games, books, a FANTASTIC cd collection, all the cooking utensils you would need and so much more! The bed was comfortable too! The yurt had a deck connected which had an outdoor kitchen. The kitchen had everything you needed to whip up a nice tasty meal. There was also a shower which was very close to the yurt and was under cover. I loved looking out of the shower into the beautiful garden... it was just so relaxing!!! The outdoors - Holley crap... talk about beautiful views! This was exactly what we wanted. We wanted to get away from the crowds and that's exactly what we got! You step out of the yurt onto the deck and look out over the beautiful garden to the cliffs and ocean, a view that would certainly never get old. The hot tub was sensational. We were there for 2 days and the water stayed warm the entire time with the help of Markus' insulation mats. It was so nice relaxing in the hot tub with a drink and some music on. The gardens were so beautiful. There were vege gardens and beautiful flowers and trees everywhere you looked. There was another section of the property were you can go make a big bonfire and look out onto the ocean. Unfortunately we didn't get a chance to do this but the area would have been great to hang out. We did walk up there to watch the sun rise which I would highly suggest. The town- hire bikes from Markus and go exploring! He has a map of a few nice restaurants too so it only takes you 20 mins or so to ride down. We went riding to the beach and had a swim and lunch and it was so much fun seeing the fishing village. Everything about Reef Break Resort was perfect. We loved the yurt, we loved the view, we loved the host and we loved the town. We would suggest it to everyone! Thank you Reef Break Resort for having us! This crib is literally right beside the ocean, the garden is so well maintained, it's immaculate. This retreat has a tropical jungle vibe! It's a really well set out, and the spa bath is massive! Marcus picked me up on time, and treated me like a rock star. He has a superb taste of music, and the stereo cranks, which means you can play music and relax! Good times! Thanks for having me.
! Paradise Wonderful stay as a solo female traveler -. Peaceful and stunning location and accommodation Markus and his wife Kyoko were warm and helpful -. I had plenty of privacy but knew they were there if I needed anything I slept to the sound of waves and had my morning coffee (and evening wine) looking out to the ocean. I made a campfire and soaked in the rotenburo. Everything is as shown in photos and description. I look forward to staying again when I return to Japan. Markus and Kyoko are excellent hosts. We got picked up from the train station and went to the local supermarket to get food and drinks for our stay. They were very helpful and accommodating. On our last day Kyoko made us cake with jam, so delicious ! The yurt and property are super amazing, very lush, cozy and cool. My favorite part was the outdoor tub and the way it was constructed, had a New Mexico feel to it which I'm very partial to. We had a great time exploring the nearby tiny villages (even though they were pretty dead- I think it's more of a summer town and we were there early October.) Cooking outdoors in the cabana at night and in the morning was so fun. All in all we had a very memorable experience and would love to come back again, maybe next time in the summer. This is the first time we booked with AirBnb and it felt like we hit the jackpot. The location is a hidden gem. The yurt and surroundings offer everything for a very unique and relaxed experience. Markus and Kyoko are wonderful hosts. The yurt is decorated with stylish and funny touches which makes you feel very welcome. It will be a challenge to find a better place to stay on Airbnb. Looking at the beautiful stars at night from the hot-tub was the best way to end our exciting trip to Japan. We will be going back for sure at some time. Thank you Markus, all the best! Markus! It was nothing short of either a miracle, or fate running it's course for us to have had the chance to stay at Reef Break. The magic that emits from the property was definitely felt and we're totally convinced that you are a Wizard. Thank you for lending us your Mom's bike to ride around the neighborhood. Thank you for picking us up from the bar and dropping us off at a perfectly warm hot tub overlooking the ocean. We couldn't have conjured a better stay, we are so thankful to have met you. We'll be in touch next time we make it to Japan and if you make it out to SF we'd love to share some time with you brother. 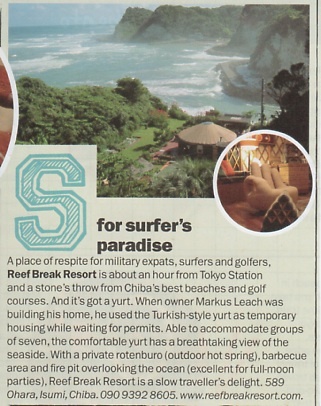 Reef Break Retreat is an amazing spot on Japan. It reminded us so much of Halemano on the coast of Maui. Secluded, serene and full of lush greenery. Markus and Kyoko were very friendly and helpful. We were able to get a ride from Markus and rent bicycles to cruise around Isumi, which was a big plus. We traveled all over Japan, from Sendai all the way down to the island of Yakushima, and Reef Break Retreat was one of the most gorgeous Airbnb locations we stayed at in Japan. Highly recommended! Oh my days, what a place !! I've stayed in a ton of Air BnB's and this was my greatest experience by far. The yurt was absolutely stunning and the views over the coast line were unbelievable. The hosts Markus and Kyoko were really friendly and were a pleasure to talk to, even running us into town to pick up supplies. Words do not do this place justice, you really have to go and see it for yourself. I can not praise this place enough. Reef break Retreat was fantastic. Myself and my boyfriend stayed for 3 nights and loved everything about it. Markus kindly picked us up (and dropped us off) and the train station. Communication was not a problem, Markus responded quickly to messages and made sure when we arrived at the yurt we knew the rules and how to use everything. Markus and his wife were very welcoming and friendly, his wife even brought us down homemade cakes which were lovely! The yurt itself was perfect, just what we needed after a busy few weeks. It had everything you would need and more. The 3 nights we spent there we relaxed in the hot tub, had a BBQ, went for bike rides around the area, chilled out by the fire pit... it was bliss. Overall I 'm really happy we decided to spend a few nights here, a really unforgettable experience. If you're trying to decide whether or not to come here, just do it! You will not regret it. Incredibly beautiful and relaxing break! My boyfriend and I stayed here for two nights after two weeks of travelling around Japan. Markus was extremely helpful from the outset, gave us plenty of information about travelling there and even picked us up from the station, showed us what to get from the supermarket, and gave us two eggs from his chickens. The place was even more beautiful than the photos, and we were extremely lucky to have great weather for both days of our stay, and with no light pollution it's really amazing to be able to see the stars, especially coming from London where that's barely possible. There were plenty of things to keep us occupied: a BBQ, bonfire, hot tub, board games, and loads of DVDs to choose from. And also thank you to Markus' wife Kyoko. She gave us some of her delicious cake, and was extremely friendly and hospitable. We would 100% recommend staying here - the only thing we would say is that you should definitely stay at least 2 nights! Otherwise it may not be possible to have the full, relaxing experience. Wow! This place is a hidden gem in Japan. We did an exhausting road trip across Japan and stayed in some busy cities. We wanted to stay in a peaceful setting where we could rejuvenate before our long drive back home and Reef Break satisfied our need for complete relaxation. This place has a Hawaii-like view, lush tropical plants, a big hot tub and shower, a unique yurt, a fire pit with a view, AND wonderful laid-back hosts. What more could you ask for?! O yea, they allowed our 2 big dogs to stay with us. Our stay at Reef Break was perfect. It is an absolutely beautiful location and the yurt was super cool and very comfortable. We enjoyed the sound of the waves at night, watching stars from the hot tub and lighting a bonfire as the moon rose...can't get much better than that! Markus was a brilliant host, picking us up from and dropping us off at the train station and giving us great tips on local places to eat etc. Him and his family were very welcoming and warm. Best airbnb we've ever stayed in! We loved our stay at the yurt! It was just amazing, I can't fault Markus as a host in anyway. He even still picked us up late when our journey there was much longer than expected. We had rotten weather so I can't say too much about the area as we weren't able to make the most of it and explore fully but the bits I did see were lovely. Also, having said that we were so cosy and having a relaxing time in the yurt that it really didn't matter. The place was immaculate and had everything inside that you would need. The Hot Tub was great too! I highly recommend staying here for a really unique experience and a welcome break from City life. Thanks so much Markus. We had a Fab time at Reef Break Resort, despite the rain and wind.. Markus was great, he came and met us at train station and took us to his yurt, gave us a map of the area and told us about the restaurants near by as well as the local stores. Markus also drop us back of at the station to go back into Tokyo, He was a great host and Reef Break was a lovely place to stay even if it was just for a couple of nights. Thank You!! creating and maintaining their beautiful place. Thank you Markus, for having us for a night and taking care of us completely, even though you and your family were very busy at the time! Markus & Kyoko were wonderful hosts. They made us feel welcome from the point we arrived until the point we left. Kyoko even baked our son some delicious cookies for our check-out. They're really a wonderful couple! Their place was simply perfect. It's difficult to describe just how beautiful and tranquil their property is. It had everything we needed for a comfortable stay. It was clear that Markus & Kyoko had thought through what guests would need to make their stay comfortable. The location really is idyllic. It is only 1h 10 minutes from Tokyo and right on the coast. The pictures capture well just how stunning the area is. Being right on the coast, you also get delicious fish and, particularly, sushi and sashimi. Markus has bikes to rent, so the best way to get around is to rent a couple bikes and just explore the area, which is just so quaint and beautiful. I'd highly recommend taking a trip out to Isumi/Ohara and staying at Markus and Kyoko's place! We really enjoyed our stay at Reef Break. It is well placed with views of the sea, and unlike anywhere else we stayed in Japan. We made good use of the cliffside bonfire area and onsen. The place has a chilled out and homely vibe, and we enjoyed cooking our own food, listening to music and befriending the chickens on our stay. I felt like I am in a resort somewhere in Asia, not like being in Japan. It is perfect get-away place for relaxing and rejuvenating. We enjoyed full moon exlipse with sound of waves. The hand-made roten-buro (outside bath) is a must-have option! I stayed here with 3 of my friends, and we all had a really good time. The fully furnished yurt was large enough for 4 people to spend a couple of nights with a spacious kitchen and BBQ stand outside to prepare lunch and dinner. During the day we sun-bathed on the deck feeling a cozy wind from the ocean, and spent our night enjoying fireworks in the garden and an open-air bath under the starry sky. Also, the hosts Markus and his wife were very accommodating and helpful. I totally recommend this place for a weekend getaway. We came with great expectations to the place and they were totally fulfilled. Markus and Kyoko have been very caring and the place is outstanding. The garden is beautiful and the Yurt is equipped with everything you can imagine, that will make your stay pleasant. The Yurt offers total privacy but with everything you need close by. We would always come back and can strongly recommend Reef Break Resort. Incredible place. By far the most beautiful Airbnb place we've stayed in yet. Markus and his wife are lovely and so helpful, bringing us fresh eggs from the chicken pen, giving us loads of restaurants tips and providing lifts to and from the station. The yurt has everything you could want or need, amazing views over the bay, an outdoor hot tub, a cosy wood burner inside and tons of dvds and cds. Can't recommend this place enough, we're already planning a return. Try to stop in at the Sake brewery before you leave, it's just a few mins from the station and they're very generous with tasters. Great location and fantastic property, was exactly what we wanted after exploring the big cities. Markus was a great host and we felt truly relaxed during our stay. Thanks! Un accueil très chaleureux. Markus est toujours disponible, souriant et serviable. Un lieu exceptionnel. Même en hiver, la yourte est chaude et on y dort merveilleusement bien! We had an awesome stay. Even though it was cold and rainy, the property is so breathtakingly beautiful it made our stay enjoyable. We loved being able to fall asleep to the sound of waves and seeing the sunrise over the ocean. Markus was really great at giving us directions to nearby restaurants. We are already planning a trip back I the summer! Thanks so much for the wonderful stay we had with you. We loved your hospitality, generous assistance and great accommodation in a beautiful location. Amaaaazing spot overlooking the ocean. By far the best view of anywhere we have stayed, hands down. The yurt was extremely comfortable and clean, and had everything you'd need for a weekend away - a little kitchen, stereo with CDs (which was perfect for some tunes outside), umbrellas, coffee, toaster, TV, DVDs, wifi, games etc. The weather was pretty cold in Tokyo so we were worried it'd be freezing in the yurt, but it was toasty warm with the wood fire going. It is very well insulated! We also had the warm spa to relax in. We stayed for a weekend and caught the train in from Tokyo on a Friday night. Was very easy. Markus picked us up from the train station and took us to the supermarket to buy some things for dinner. Such a nice host! The cabana next to the yurt is the perfect spot to cook up a meal and enjoy the sound of the ocean. We walked about a half hour to a little Izakaya on Saturday night, the food was great (super fresh sashimi) and the locals there were very fun and friendly. We were there for quite a while drinking and chatting, and Markus called the restaurant wondering if we wanted to be picked up. It was so thoughtful - we were stoked! This was a fabulous place to stay. The views are amazing! Exploring the surrounding villages is easy to do on foot. Markus and his wife were the perfect hosts. Every detail was looked after and some we didn't expect. The yurt was spotless and very comfortable. Highly Recommended. Very nice spot right next to the sea. The pictures are completely true to how it really looks. Pity we went on a rainy day. But we still really enjoyed our stay with this big yurt right next to the sea and the outdoor hot tub. Beautiful landscaping too. The only thing is we took the wrong slow train from tokyo station and was a pain to get there. Make sure you take the express train if you are going there. Will definitely recommend to friends. We had a great time at Reef Break! We spend 3 Nights there and it could have been much longer. Markus and his wife are very kind. Markus showed us on the map, nice places to go. And they are all in walking distance (about half an hour). We had no car and enjoyed to walk around, visiting those little villages and taking a bath on a beach just for us alone. It is a very beautiful place just to calm down and relax. We also enjoyed the great cicada concerto and sitting in the garden during "Fool" Moon. The yurt is very cosy, and the garden is wonderfully made and you can see on many details how this place is made with lots of love. We had an incredible summer vacation in Isumi at Markus's yurt. First, the view at Reef Break was spectacular. The landscaping was lovely. The stars at night while you sit in the hot tub were beautiful. The yurt was clean and very well equipped, including wifi. Markus was a welcoming host. He had bikes for rental, and a map of the area including his restaurant recommendations. We tried 3 of the recommended restaurants and loved each one. My husband, David, and Markus got along well. Markus had a nice collection of rock n roll and a stereo on which to play it. Overall, I would highly recommended the yurt for you visit to Chiba. My friends and I stayed here last month and it was amazing. Everything from the Yurt to Markus's hospitality. The surrounding area is full of the beautiful sights and sounds of nature, so if you're looking for a nice and convenient retreat from the hustle and bustle of daily life, give this place a go! The Reef Break Resort is an amazing place and we could not have asked for a better end to our 'round-the-world honeymoon. Markus and his wife were incredibly kind and gracious and made sure we were comfortable and enjoying our stay. The yurt had plenty of space for the two of us but could have fit several more. It included everything you'd need for a pleasant stay - dishes, towels, blankets, pillows, a fridge, stove and even a wine rack and much more. The kitchen, grill, bathroom and shower were all comfortable and excellently maintained. The grounds are beautifully landscaped and there are several spaces you have the opportunity to enjoy including the hot tub, deck and the hill-top by the fire pit. The view is magical and the location is close to town for quick bike trips to the store, beach or restaurants. Markus gave us a map and great recommendations for nearby activities. He even helped me arrange a surprise Shinto wedding ceremony by a local priest that my wife thought was incredibly special. Highly recommended! Markus, Kyoko and Zippy - Thank you! Wonderful place to stay! Very relaxing, beautiful surroundings and great facilities! The owners couldn't have been more helpful and we cannot wait to visit again! Thank you. Thank you Markus and Kyoko for such a fabulous stay at the yurt. Such a blessing for a relaxing few days during a busy year for us! Jill & Dave. I formerly lived in Tokyo and recently returned for a visit. What a pleasant surprise to discover Reef Break! My friends and I stayed there twice for a few days and had a fantastic time. Perched just above the Pacific Ocean, the location is ideal. The setting is scenic, beautiful, and romantic. I live in Bali and the lush garden landscape reminds me of home. Other than the sound of rolling waves, it’s very quiet and peaceful. What a perfect get-away from the hustle and bustle of busy Tokyo! We barbequed and soaked in the hot tub nearly every night. The skies were clear and the weather was glorious. We watched a gorgeous sunrise one morning, and myriad stars shone brightly every night. I’m an ocean enthusiast so I really enjoyed the cove and went swimming every day. The owner Markus took us snorkeling at another location one day and body surfing another day. We even did a yoga session, which was stimulating and fun. Don’t forget to try a massage from Kyoko…she’s great! We had a wonderful time and I certainly intend to stay at Reef Break again next time I visit Japan. The most relaxed place in Japan. Thank you Markus & Kyoko for the beautiful memories! We can"t wait to come back!!!! !